everyone has a safe, decent place to call home. ​​We are a tax-exempt nonprofit housing organization that has served Southeast Iowa for 25 years. Locally, we operate in Cedar, Iowa, Johnson, and Washington counties, and globally we support Habitat for Humanity International's efforts to build in 70 countries. Because decent shelter in decent communities should be a matter of action for all, we bring people together to build, rehabilitate and maintain safe, decent and affordable homes. We also advocate for fair housing policies. We invite you to join us as we build up strength, stability, and self-reliance through shelter. Iowa Valley Habitat for Humanity partners with local individuals, businesses, and community organizations. Your tax-deductible contribution to Iowa Valley Habitat for Humanity is a long-term investment in our community, impacting residents in Cedar, Iowa, Johnson, and Washington counties. In addition, we tithe a portion of every dollar you donate to help build homes alongside families living in developing countries. Our community has demonstrated generosity by serving our mission to overcome substandard housing. Volunteers contribute thousands of hours each year. Bring along your willing attitude and we will provide you with all of the tools and training you need! Every volunteer makes a difference. Together we have also been able to build ramps for people with disabilities and make improvements to the safety of existing homes so that more people can remain self-reliant in their own home. Each and every day, people partner with Habitat for Humanity to offer families strength, stability, and self-reliance through shelter. Through this partnership, each family has the opportunity to build and purchase their own decent home with an affordable mortgage. When future homeowners are surrounded and supported by determined volunteers and generous donors, a future full of opportunity is built. I believe purchasing an affordable home is a stabilizing factor for our communities in Southeast Iowa and provides social and financial benefits for persons and families who have purchased a home through Habitat for Humanity." 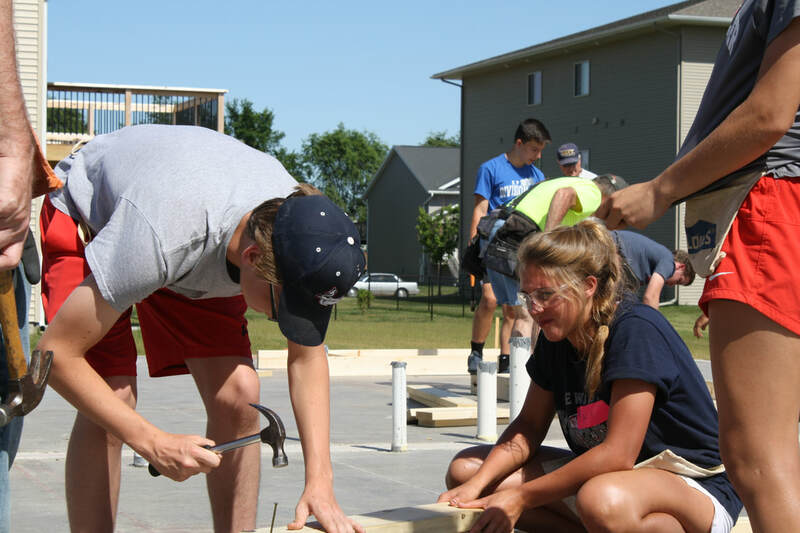 Locally, Iowa Valley Habitat for Humanity has constructed and renovated over 150 homes in Cedar, Iowa, Johnson and Washington counties since 1992. Globally, Iowa Valley Habitat for Humanity has donated more than $360,000 to Habitat for Humanity International, enough to build more than 120 decent homes in developing countries around the world. The gift of time is one of the most valuable donations Iowa Valley Habitat for Humanity receives. Each year, thousands of volunteers selflessly put in around 16,000 hours of service on our local build sites, in our ReStore, serving on our Board, on committees, as office interns, hosting fundraising events, providing snacks for volunteers and advocating for affordable housing. Proceeds from sales in the Iowa City ReStore help fund the Iowa Valley Habitat for Humanity mission. Since 2005, the Iowa City ReStore has partnered with the community to provide funding for the construction of 10 Habitat homes. We couldn't do it without hundreds of volunteers like Arden (pictured above). Congratulations to Watts Group and IVHFH Board member, Brent Yirkovsky, who received a Greater Iowa City Home Builders Association Excellence Award. We are proud to see these Habitat for Humanity partners earn this prestigious award. The advice and guidance Brent and the rest of the Board provides our affiliate is invaluable. ​We salute all members of The Greater Iowa City Home Builders Association who participated in the the 2018 Parade of Homes. ​William Laubengayer, affectionately known as “The Grouch,” was inducted into the Iowa Volunteer Hall of Fame by the Governor at the State Capitol on April 26, 2017. We are proud to celebrate one of Iowa’s most amazing volunteers! Thank you for spending thousands of hours over the past 20+ years serving our affiliate and sharing your knowledge with us! Christy Shipley, Iowa Valley Habitat for Humanity Construction Manager, has been honored as one of the Corridor Business Journal's Women of Influence. Christy is celebrated as a role model in the field of construction and for leadership in the community for over twelve years. We are proud of Board member Raquishia Harrington who was also named a Woman of Influence for her service to the community. "Best Non-Profits to Work For"